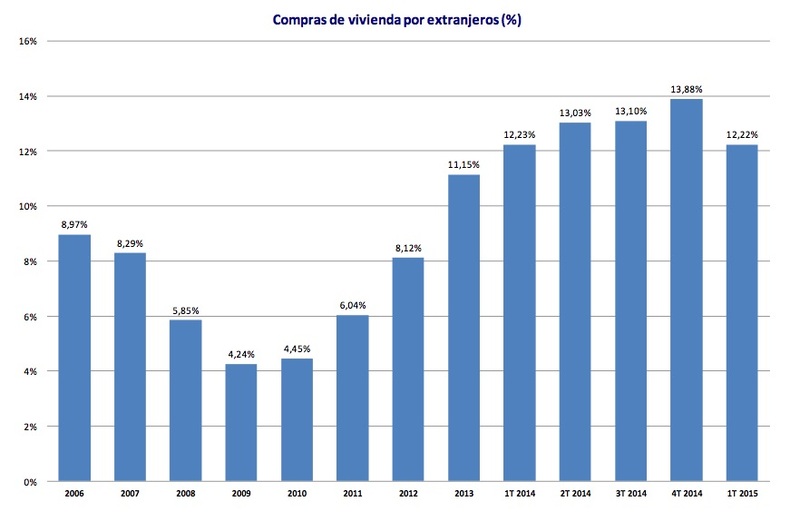 Foreign buyers were involved in 11,045 Spanish home sales registered in the Property Register in the first three months of the year, reveals the latest report from the Property Registrars (Registradores). Foreign demand was up 10 per cent compared to the same time last year. As usual, the British were the biggest group with 18 per cent foreign market share, followed by the French with 10 per cent, and Germany on 8 per cent. The ranking of foreign demand by nationality followed a familiar pattern, with the exception of Russian demand, which took a dive thanks to the weak Ruble and other economic problems at home. Russian buyers fell by 37 per cent compared to last year, pushing them from third place to sixth place behind Sweden. British demand, on the other hand, rose yet again, by 29 per cent to 1,956 home purchases registered in Q1. Italian and Chinese demand clocked up bigger percentage increases, but those markets are still small compared to the UK, where demand for homes in Spain is no doubt being encouraged by a stronger Pound. “The reduction in Russian demand will possibly be replaced by other nationalities taking advantage of the weak Euro,” suggest the registrars. 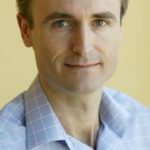 As a percentage of the overall market, foreign demand, at 12 per cent, was almost exactly the same as it was Q1 in 2014. It would have been higher were it not for the first signs of life creeping back into local demand, up almost 1 per cent on last year. 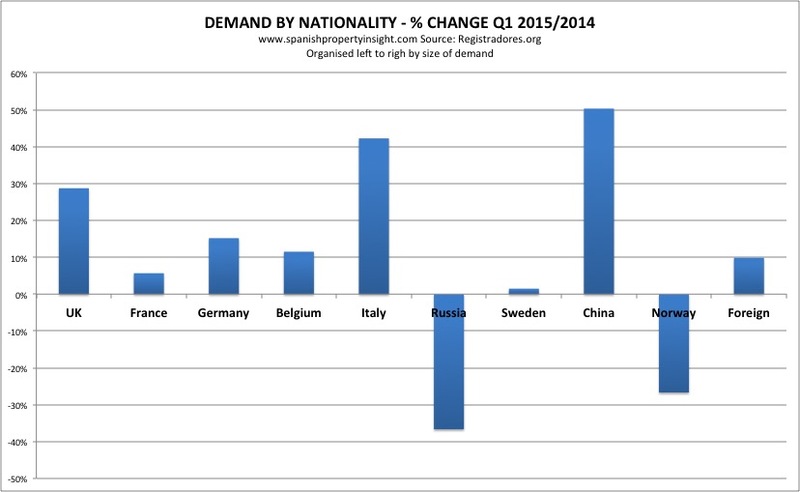 Foreign demand as a percentage of the overall housing market. Source: Registradores. 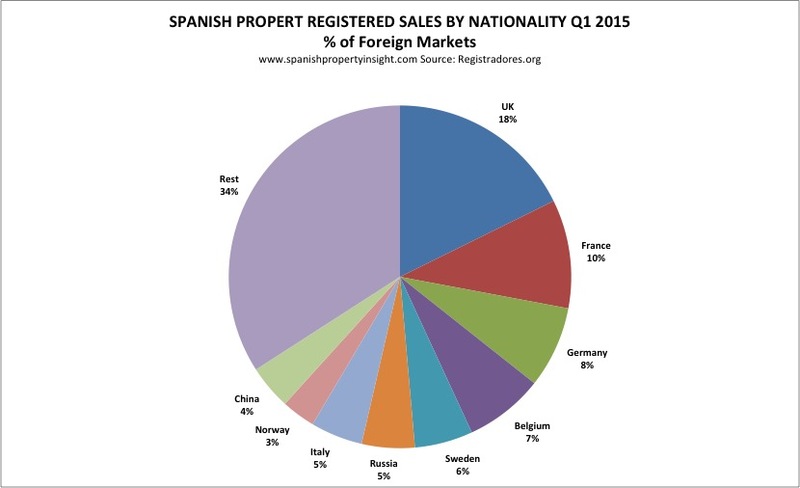 Foreign demand usually dips in Q1 as foreigners tend to buy holiday-homes in Spain from Springtime on.